We are honored to partner with San Francisco Business Times to present the Bay Area CFO of the Year Awards. Together, we produced a special section for their publication featuring all of this year’s Winners and Finalists. 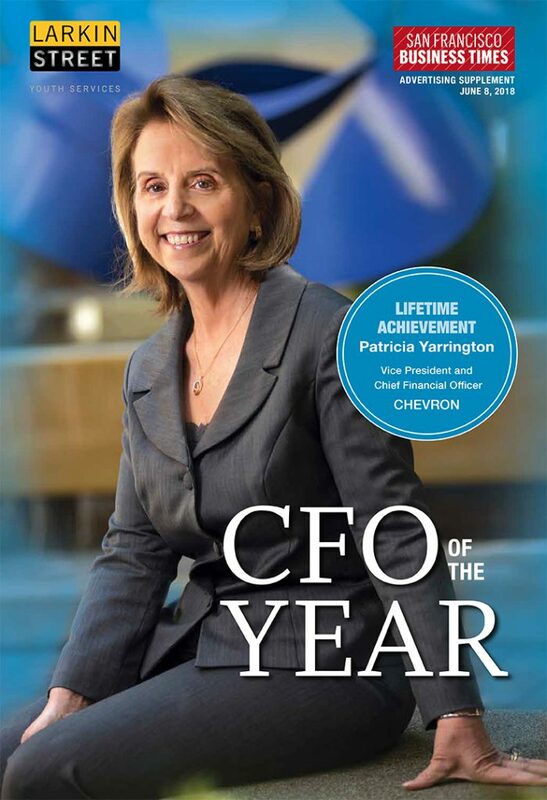 Check out the feature on Patricia E. (Pat) Yarrington, Vice President and Chief Financial Officer of the Chevron Corporation, our 2018 Lifetime Achievement Award winner. The special edition also includes unique financial strategies highlighted by nonprofit CFOs like the Tiburcio Vasquez Health Center’s Brent Copen, First Place for Youth’s Liz Bender, Playworks’ Tom Low and Larkin Street Youth Services‘ own Sherilyn Adams. Read the special Bay Area CFO of the Year section online on the SFBT website, view and download a PDF of the supplement here, or read below via Issu.